With our cost effective plans we are known to be one of the lowest priced companies. Go ahead and try to find someone cheaper who can present the quality of work that we do. We have award winning designers to take of your projects. Anywhere from a basic template, to a complete state-of-the-art website with video or flash. We do it all! With 9dlabs you are sure to get all the support you want within 48 hours from our dedicated support teams. That’s “best in class” support offer, it just can’t get better & faster than this! We are a creative agency based in Asia dedicated to creating fresh ideas whether it be online or design for print. Our work has depth and theory as well as clean aesthetics and presentation. Our work spans across all design medium for both digital and offline materials. Services include websites, motion video, and printed material such as corporate identities, catalogues, logo design etc. We focus on truly exceptional web development and design that is within budget. We won’t pull the wool over your eyes: we´re real, genuine people who will treat you as a real, genuine person. We’ll answer your questions and make sure you are comfortable every step of the way. We build websites because we love interacting with clients, because we continue to be fascinated by the internet, and because we love what we do. Don´t get amazed by our unbelievable low rates for any of our designing plans as we are always focused to provide you with exceptional designs that look unique, consist full of features and give you the best experience if you are customizing it anytime. We are a small design & creative agency. Being small allows us to be flexible, quick to react and personal in the service we offer our clients. We have the business wide goal of bringing a creative touch and spark to the design of your new digital media. We like to create things we can be proud off. With over 5 years of experience in the Design Industry, we are a team made up of both Young and Fresh creative minds as well as experienced individuals with Industry Knowledge. Please don’t hesitate to get in touch with us if you want to discuss a possible project. Website Design: Adobe Photoshop, Flash. Logo Design: Corel Draw, Illustrator, Photoshop. Motion Graphics Video: Adobe After Effects, Vegas. Operating Systems: Windows 2003, Windows 95, Windows 98, Win ME/XP, Windows NT/2000, Linux, Unix. Databases: MS SQL Server, MS Access, MySQL. WebServer: IIS, Apache, Red Hat Secure. E-commerce: Paypal, 2Checkout, Authorize.net, CCAvenue, Google chekout etc. 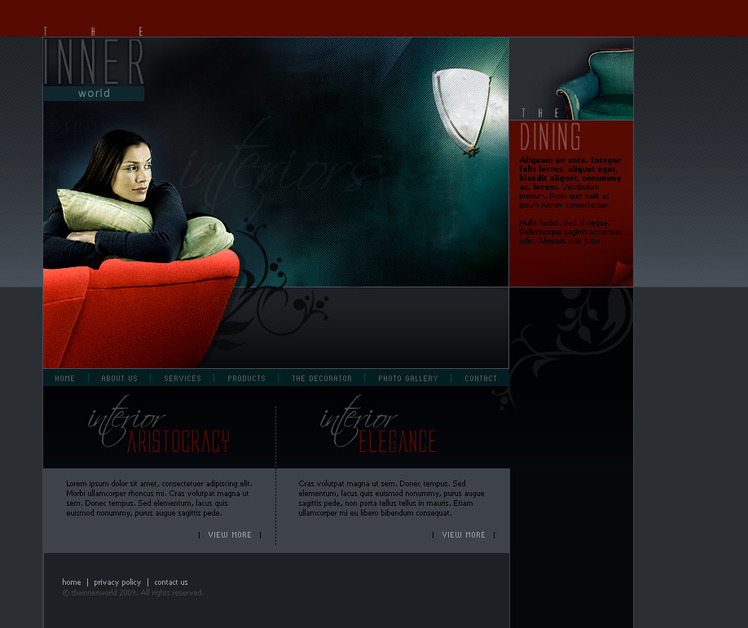 Website of an interior designing company. We created the design and code them from scratch. Design, Front-end development, jQuery Integration, PHP contact form and Google Map integration was successfully done to make the client happy with the end results.